In a season that has mainly been framed by statistics Steelers fans would rather not read, here are some good ones. On Saturday, they chalked up their biggest win, first shutout and achieved their first three-winning sequence on the bounce. Powerplay and penalty killers did their job, both units scoring. But behind the numbers, lies something even more positive. Tom Barrasso has got the team working for each other, has found chemistry across three lines and, at last, found a way to score goals and stop them. The weekend 4-0 win came against Dundee Stars, not Cardiff Devils or Belfast Giants. But the style they played, particularly in the first and third periods, gives rise to hope that the team, after all, can make up lost ground on the EIHL's power brokers. Goals from Justin Buzzeo, Jonas Westerling, Josh Pitt and Jonathan Phillips, did the trick and should send a signal to Steelers fans who couldn't make the match - Bonfire weekend brought the attendance down to 4,110. Afterwards, Barrasso's normally steely-assessment was tempered by praise, particularly for workaholic centre Jonas Westerling and goaltender Jackson Whistle. Of the Swede, the coach said: "Goals are nice but I think he knows how much I value him as a player. I have got great confidence in him, obviously killing penalties, and putting him out in difficult situations five-on-five, sometimes the goals dry up for a while and you can't judge a player just based on that." As for Whistle, who must now compete with Matt Climie for the starting spot, Barrasso stated the goalie who wins games will keep his spot. He said it was rewarding to see Whistle's confidence coming back. "It will be a good predicament to have if I have both goalies playing that well." "That doesn't mean you are going to win a best of seven series against that team but I think we can compete night in night out with the effort level we are bringing right now." 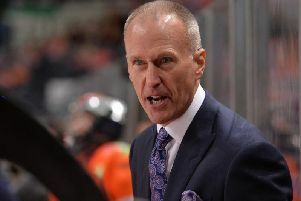 "We are looking to get pucks behind teams' defencemen and go to work on them, and control the puck in the offensive zone and then defend hard in our zone with five men and then break pucks out with speed. We've done a good job with that and that's our focus."